We are introducing a new feature for Gold Star resumes. We will show you the latest views of your resume so you can see who might be interested in you. This feature is currently in beta and we will review it as we move forward. There are a few caveats to this feature which you can read about here. We have added a new field for job listings called “About Your Church.” The new field allows you to enter snippet or short description of your church or organization that will be separate from your job description. If you have already posted a job listing, you can edit it now to add a blurb about your church. We have had a few issues with our search engine and we finally got things sorted out. You can now use the Keywords field to search jobs by Title, City, State, or Zip Code. Just type your search and hit enter. You might search for “Music Director 85748” or “Dallas TX,” etc. If you don’t get the results you want, use fewer words in the search. We have added new indicators for time type in the search results and the individual job listing pages. We hope this will help you gain as much information at a glance as possible. On May 7, 2017 we noticed some of our customers received multiple password reset emails. After looking over our logs we reached out to our server company for even more assistance in determining what happened. A security review of our server and logs was performed by an outside company and they determined there was no malware or access to our database, although there were many attempts to access the database. After an extensive investigation, they were unable to find an intrusion point and told us we were in the clear. We are nonetheless requiring everyone to reset their passwords. When you login to your account you will be prompted to check your email for a reset link. Please follow the procedure to reset your account password. It is also advisable to reset passwords for any other accounts where you use the same username and password. We apologize for the hassle this may cause you. Keep in mind, we save no financial information of any kind on our server. It is never a good idea to reuse passwords on multiple sites. We highly recommend using a password manager. We will never sell your data! ChurchJobs.net is proud to say we never sell your data to anyone. We collect the minimum amount of information from you as possible that is required to place your church job listing or resume on our site. While we have your email address on file, we never sell it to anyone. We never even accept money from advertisers who want to send you email and we never send unsolicited emails. Our emails consist of notifications, expiration notices, job applications, etc. That’s it! Several advertisers have begged us to target our users. They say we are leaving money on the table. We don’t care. 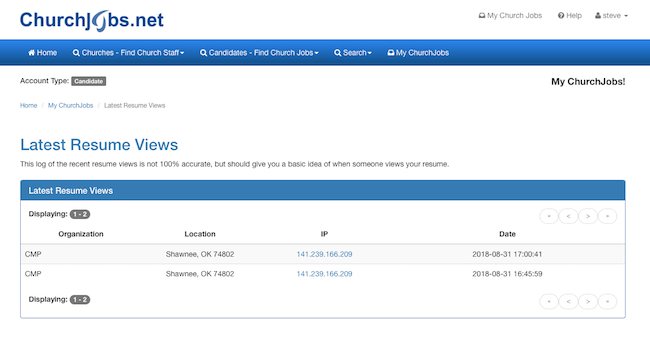 When you sign up at ChurchJobs.net, you can be assured we care only about matching a church with a potential pastor. While we do supplement our revenue with a few network display ads, we keep them out of the way and to a minimum. You might also notice when you visit ChurchJobs.net it is over a secure (https) connection. Our entire website is now secure for your privacy! We have changed our bulk pricing structure. We previously sold Gold Star listings in bulk, but you can now purchase Premium listings in bulk, for the 1 month price. Have a look at the chart above, or check out our bulk prices. 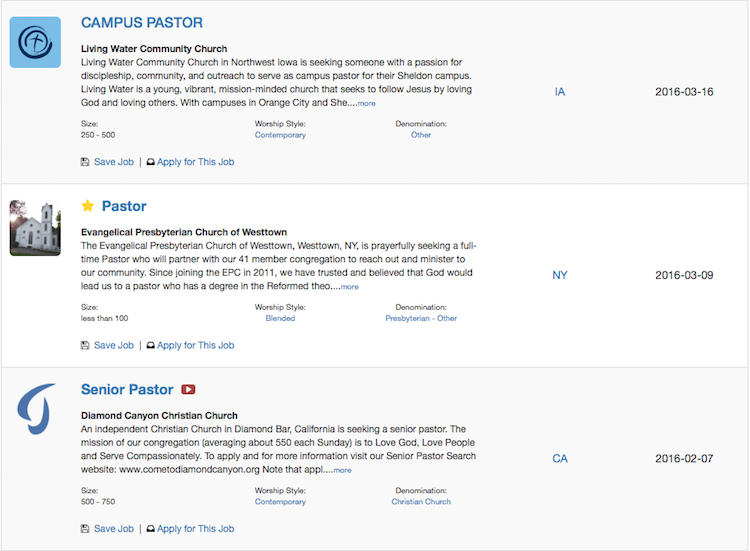 We have made one of our favorite features available to churches who purchase Premium+ job listings. Automatic Applicant Screen was reserved for Gold Star listings, but can now also be used by Premium+ listings. Let ChurchJobs.net screen applicants for you by setting special requirements for applicants to meet before they can apply. To take advantage of this feature, purchase a Premium+ or Gold Star job listing. We have redesigned the search results lists for both job listings and resumes. As more churches add logos, we think this view will be more compelling. You can get more information in the search results, and save and apply for a job right from the results. The same applies for viewing the resume database. Churches can now get more information from the results screen. Both churches and candidates can dramatically increase the effectiveness of their listings by adding a picture. Trust us, it works!